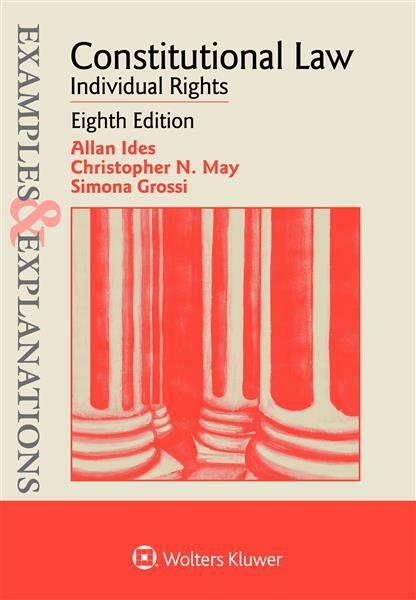 Examples & Explanations: Constitutional Law: Individual Rights provides a clearly written, comprehensive examination of constitutional doctrine pertaining to individual rights. Along with its companion volume, National Power and Federalism, it provides students and teachers with a highly readable and accessible study of constitutional law. Both volumes combine detailed textual material with real-world examples and explanations that apply the relevant constitutional doctrine to specific fact patterns. The organization of Individual Rights parallels and complements any major constitutional law casebook. In fact, it has been assigned as required or recommended reading in a number of constitutional law courses across the country. Updated material on the right to marry, including discussions of Obergefell and Windsor. Expanded discussion of Casey, as well as other cases having to do with a woman’s right to obtain an abortion. Coverage of recent Supreme Court cases, such as Murr v. Wisconsin, having to do with the Takings Clause; Trump v. Hawaii, concerning the Trump administration’s travel ban (which, among other things, repudiated the court’s decision in Korematsu v. United States; Evenwel v. Abbott and Abbott v. Perez, which dealt with the redrawing of districts by the state of Texas; and Fisher v. University of Texas (II), concerning affirmative action by universities). New examples with comprehensive explanations of the rationales behind the answers.